Please note Watson's wonderfully relaxed pose with the decanter. Archive. Clicking brings you to the excellent Victorian Web. I will admit that I would probably have gone to great lengths to include a Sherlock Holmes story in this series, but thankfully I don't have to. 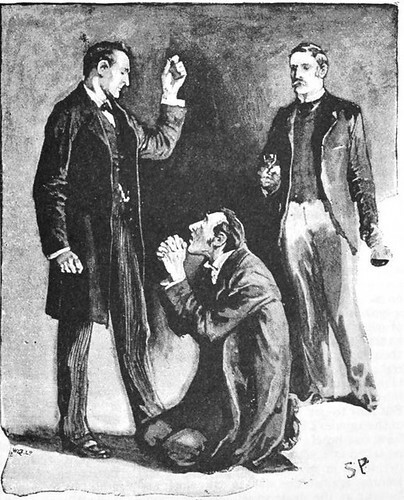 Go to great lengths, that is: The perfect story is right there in the very first collection, The Adventures of Sherlock Holmes (1892). It is titled "The Adventure of the Blue Carbuncle" (which, I grant you, does not automatically scream Christmas, but stay with me) and was first published in The Strand Magazine in January 1892. An American publication gave it the title "The Christmas Goose that Swallowed the Diamond," which is a little more festive; but I feel that rather gives the game away too early. Pretend I did not mention that. It opens in 221B Baker Street, as so many Sherlock Holmes stories do, even though Watson has actually moved out at this point in order to marry the most insipid woman in literature (that may be an exaggeration, but probably not). I had called upon my friend Sherlock Holmes upon the second morning after Christmas, with the intention of wishing him the compliments of the season. He as lounging upon the sofa in a purple dressing gown, a pipe-rack within his reach upon the right, and a pile of crumpled morning papers evidently newly studied, near at hand. Beside the couch was a wooden chair, and on the angle of the back hung a very seedy and disreputable hard felt hat, much the worse for wear, and cracked in several places. I rather think the second morning after Christmas is a little late for Watson to pay Holmes a Christmas visit; but don't mind me. This is a classic opening, in a way. Not only the location, but the opportunity for a minor bit of deduction before the main mystery begins. Holmes' relaxed pose and the suggestion of clutter is also not out of the ordinary (there is a wonderful description of the chaos that is this corner of Baker Street in the opening of "A Scandal in Bohemia" (which, if you haven't read it, I have no idea what you have been doing with your lives), which endeared Holmes to me early on). Dr Watson is unusually right here: While he is apparently quite wrong, as usual, the hat does lead them to crime, eventually. There is, however, no foundation for that deduction yet, and Holmes, who can usually spot the crime in the most innocent-looking circumstances, is apparently in a very mellow mood. This would not be altogether unusual, however; as both Holmes and Watson observe in this story, quite a few of their adventures. Unlike Agatha Christie, whose stories generally revolve around murder, Doyle wrote a number of quite bloodless plots, sometimes quite quite innocent resolutions ("Whisper Norbury in my ear" etc). The trail takes them from the inn to a Covent Garden salesman, who turns out to be particularly tight-lipped (mainly because he is fed up with people, and in particular people talking about geese, which I suspect is an unfortunate condition to be in for a person selling geese at Covent Garden). Holmes is a sneaky connoisseur of human nature, however, and bets that the birds were country bred; to prove him wrong, the salesman tells him exactly where they came from: a Mrs Oakshott. As they stand laughing to themselves over how easily someone who would not give the information for a hundred pounds is quite thrilled to provide it for a pound if in the shape of a wager, another man comes along to aggravate the salesman, finally tipping him over the edge. It turns out Ryder is the brother of Mrs Oakshott, and that she had promised he could pick the goose he liked for Christmas. And, desperate for a hiding place for the carbuncle after the theft, he shoved the stone down its throat. He is interrupted by his sister, but in the end she allows him to kill the bird and take it with him immediately. In the confusion, however, he has taken the wrong bird, leaving the right one to be sold to to the Covent Garden salesman, who sold it on to the Inn with the goose-club, who eventually gave it to Henry Baker. Ryder is understandably rather annoyed to now be facing jail for the theft of riches he did not even get to enjoy, and he pleads his case quite pitifully. Possibly disgusted by it all, Holmes tells him to get out. As Richard Lancelyn Green observed in his notes to the Oxford edition of the stories, however, Holmes was not commuting a felony at all (only the Crown can do that); he was, however, compounding it by (presumably) taking a reward without prosecuting the person who had committed it, which apparently made him guilty of "misprision of felony". But since Dr Watson is not likely to tell anyone (except the whole world), Holmes is probably safe. To round off the tale, they sit down for "another investigation, in which also a bird will be a chief feature". And all is well. Jeg kan ikke huske hva jeg tenkte om denne da jeg leste den, men det er ikke så lenge siden jeg så den (med Jeremy Brett som Holmes), og den hadde ganske god julestemning vil jeg si. Cred for å komme opp med ting jeg har lest, som jeg ikke tenker på når jeg prøver å komme på julefortellinger, men som jeg likevel innser er julete som bare det når jeg tenker meg om.